Conor Perry from Cork completed his Leaving Cert in our College last June and he received outstanding results in August. He is now studying Business, Economics and Social Studies (BESS) in Trinity College Dublin. Last Wednesday night TCD honoured the students in 1st year who received excellent Leaving Cert results. Conor attended this ceremony with his parents and received his Entrance Scholarship Award. 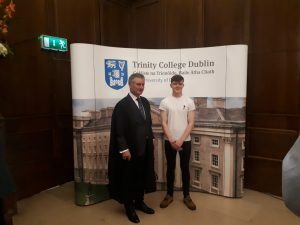 We congratulate Conor and wish him every success in his studies at TCD and in his future career.